Trevor Surprise 40th Birthday Party! Modern Print and Designs Partner Trevor Collins, was taken completely by surprise by the gathering organised for him on 20th June by his colleagues. It had all been arranged by Jackye who...	Read more.. Here are two of the latest Pavement signs our printers in Pembrokeshire have produced for St Teresa's Hotel and Tea Room in Tenby.The two Ecoflex signs were printed in full colour both...	Read more..
You may recently have attended an event or presentation by IRONMAN Wales giving you some great tips on how to engage with this business opportunity.Something which you can do immediately,...	Read more..
Jubilee and 30th Birthday Party Goes With A bang! Trevor along with his family, celebrated both the Diamond Jubilee and his brother's 30th birthday on 4th June 2012. What's more, they had the only dry day of the weekend...	Read more..
Free Standing Pavement Signs In Pembrokeshire From £127! You can now get free standing pavement signs in Pembrokeshire from Modern Print and Design, so you won't have to deal with impersonal Internet suppliers. Your £127 pavement sign has...	Read more.. If you want luxury accommodation in Pembrokeshire look no further than Roch Castle. It has been transformed into truly luxury accommodation with a £5.8 million renovation. The results have to...	Read more.. 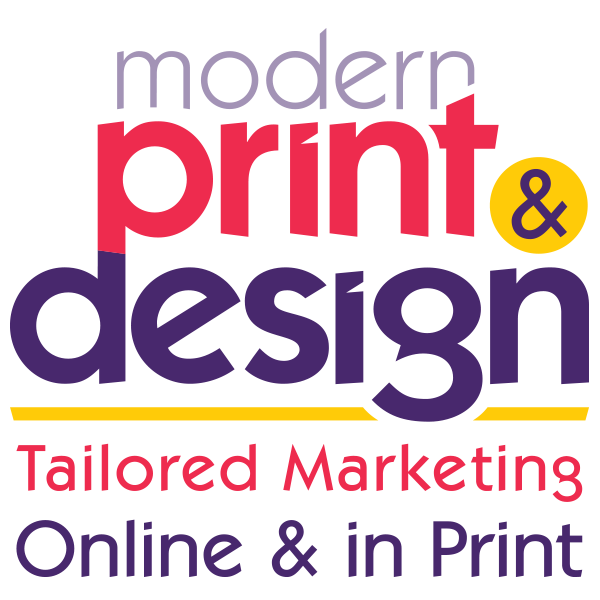 If you are looking for Graphic designers in Pembrokeshire, you need to speak to Modern Print & Design.With over 50 years experience our graphic designers in Pembrokeshire will bring you...	Read more..
A version on the traditional Nigerian bank scam is hitting the letterboxes of Pembrokeshire. However, the letters are much more professional looking that the African version and are posted to...	Read more.. Following the delivery on her new business cards, Modern Print and Designs Trevor Collins called Lyn Martin to make sure she was happy with everything. However, Lyn was not in at the...	Read more..
You can now have printed feather and teardrop flags in Pembrokeshire to help promote your business or event to the public. The flags can be supplied from 2.3m tall to...	Read more.. When Uniqueworks Ltd, an artisan furniture making business, needed some business cards produced quickly for their relaunch it was Modern Print & Design they turned to.The business cards were designed and...	Read more..
You can now get free standing pavement signs made at Modern Print and Design. You can choose from a range of swing, 'A' frame, and fixed free standing signs, perfect...	Read more..
Modern Print and Design received the following email after delivering the menus it designed and printed for a Milford Haven cafe -Trevor, Matt and the team at Modern Print, We are delighted...	Read more..
On Friday Welsh Conservative leader and AM Andrew R T Davies paid a surprise visit to Modern Print & Design whilst in Pembrokeshire.During his visit managing partner Trevor Collins and Andrew discussed...	Read more..
Pembrokeshire Wine Merchants Recommend Modern Print and Design. Pembrokeshire Wine merchants Wilson Wines recently asked Modern Print and Design to give their wine bottle label a make over. The graphic designers came up with a number of options...	Read more..
Modern Print and Design recently printed an election address for Cllr Phil Baker, an independent standing in Saundersfoot for Pembrokeshire County Council. His A4 election address was printed in gray...	Read more..
Pembrokeshire was left behind when Trevor visited the annual sign wighting and digital printing exhibition, in Birmingham's NEC on Thursday 29th March 2012.Of particular interest were the new range of...	Read more..
‘Just Desserts’ Thank Modern Print and Design With A Cake! Pembroke Dock pudding makers Just Desserts, have thanked Modern Print and Design for their new logo with a cake. Everyone in the the studio was delighted with this unexpected gift.Over...	Read more..